Pride of place at the Yorkshire Museum is given to a life-size, near complete statue of Mars. 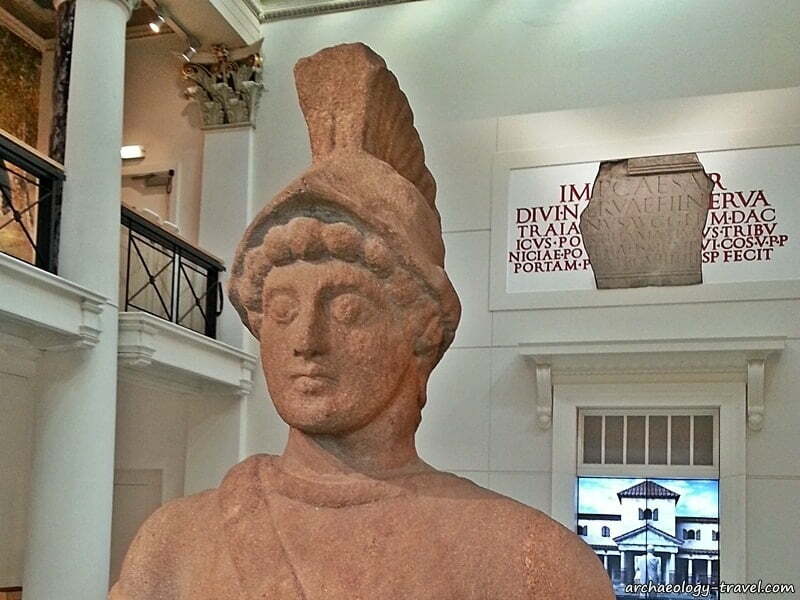 This stunning stone statue stands at the entrance to the museum’s galleries in front of a floor map of the Roman Empire. The juxtaposition is intentional and quite meaningful. Mars was the Roman god of war, whose religious significance was second only to Jupiter and Neptune. Mars was, however, the most important of the military gods. Military success was not only the result of soldiers’ skills and prowess on the battlefield, but also of divine will. A special relationship with the gods was greatly desired, and religion was as important in battle as it was in daily life. Not surprisingly then, the legionary fortress in Roman York, or Eboracum, would certainly have had a temple dedicated to Mars that this statue adorned. In the face we see a youthful, clean shaven Mars. The statue was carved dressed in full military, amour including a helmet on his head, a sword on his left hip (see the first photograph) and holding a shield to his left. All that is missing are the feet and right hand. Just as Jupiter was depicted with a lightning bolt and Neptune with a trident, so too Mars is more often than not depicted with a spear. Consequently, it is highly likely that a metal spear was held in the missing left hand. And like all Roman stone carvings, this statue would surely have been painted to make it more life-like. The statue has survived complete with shield, and in all likelihood held a spear in his right hand. 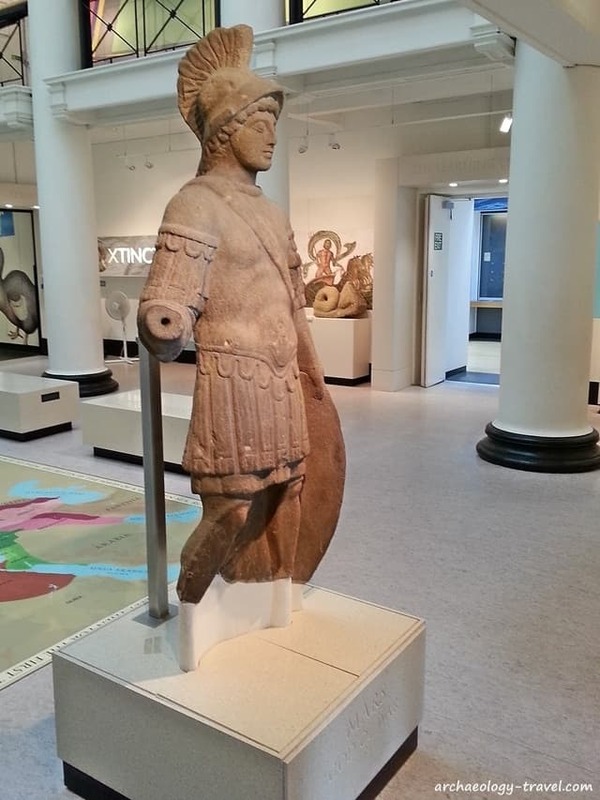 You can not miss the statue, it is located beyond the Yorkshire Museum’s ticket office just inside the entrance to the Neoclassical Central Hall – off which all other galleries are located. Around the edge of this gallery are some of the more spectacular Roman artefacts found in the city of York during the 1800s. These include the final known Latin inscription of the Ninth legion (look on the wall behind the head of Mars in the photographs above). Set in the floor of the Central Hall is a map of the Roman Empire at the height of its power. An Empire that was created through numerous military campaigns, across Europe and the lands on the edge of the Mediterranean. And of course it was the military that defended the boundaries of the Empire; one of the most well known being north of York – Hadrian’s Wall. At the York Museum today this superb statue of Mars presides over the Empire at its full extent, just as the Romans believed their success in creating that Empire was due to its special relationship with their gods.